This entry was posted in photography, photos, quotes and tagged flowers, Gilda Radner, life, photography, photos, quotes, spirit, wordless wednesday by Lilli Day aka bookbabie. Bookmark the permalink. There may be no guaranteed happy endings, but taking the journey is what makes each of us a hero in our own way. I LOVE that quote. Beautiful picture, too. yup! something to ponder on…pretty yellow flower! 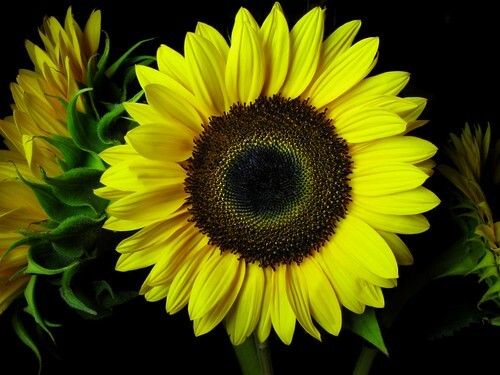 What a beautiful Sunflower…love that quote. I really loved Gilda. Such a great woman she was. lovely quote and lovely picture. Gorgeous! I love, love, love sunflowers. I’m hypnotized by the eye of that sunflower. That is a beautiful picture…sunflowers are def. one of my favorite flowers!! Beautiful picture and quote. Thanks Lilli. What a fantastic quote! I love Gilda Radner, she was so funny. Beautiful pic, beautiful quote! I miss Gilda! My sister is from the land of snow and is just away on vacation to the land of sun. I am just glad she will be home soon. I see we were both on the same sunflower page yesterday. What a beautiful photo, and lovely quote too. Great quote. That photo is AMAZING! Really beautiful. Great pic and quote! Is that from her book? I loved her book, and I do miss her. She was funny lady. This is a gorgeous sunflower capture! Love the qoute!